Movie-addicts, listen up: Telltale Games, founded by veteran designers and developers from LucasArts, has a few goodies in store for you—namely, new games based on Jurassic Park and Back to the Future. 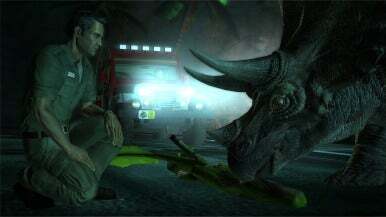 Jurassic Park: The Game will debut in April for both Mac and Windows. Featuring cinematic graphics and a fast-paced storyline, Jurassic Park picks up in the middle of the first movie and follows a veterinarian and his daughter as they try to escape the island. The game's plot centers around the embryos that crooked computer-network engineer Dennis Nedry dropped before his untimely demise. At a hands-on demonstration on Wednesday, the adventure title looked close to ready on the whole, with a few loose threads showing here and there. In the build we saw, Jurassic Park sported moderately blocky 3D characters that reminded me a little of Sega’s Jurassic Park arcade game. 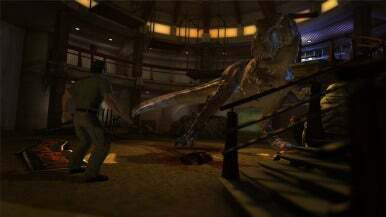 The environment looks better, however, and the dinosaurs are more realistic than they were in Sega's 1994 rail shooter. Gameplay is a mix of puzzle-solving and basic keyboard agility—in the few scenes I played through I was required to find a code, close a gate (by twirling the joystick on an Xbox game controller), and dodge the attacks of a fully grown triceratops. So while it won’t be as gunplay-centric a game as Dino Crisis, Jurassic Park won’t be a simple walk in the park either—there are dinosaurs to confront and you could be raptor food. The current version of the game is set up to be controlled with a game controller, but the final version will have mouse/keyboard controls. Gameplay appears to be pretty linear—while you can look around and explore scenes, the missions I saw appeared to have only one way to accomplish a task. I assume there will be a couple of major forks in the game to provide more choices to the user, but it’s important to remember this game is really more about the storyline and characters than open-ended pioneering. Like Telltale’s other games, Jurassic Park is episodic—the first episode will be released in April, and subsequent episodes (five in total) will be released each month after that. The full game is $35, but pre-ordering now will get you a $5 discount. At the moment there’s no plan for an iOS version, but Telltale hinted that it’s a definite possibility. 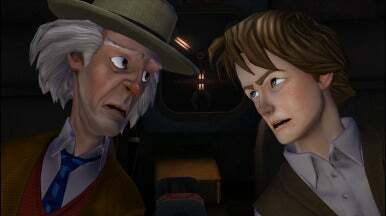 Telltale is also promoting another movie-inspired game, Back to the Future: The Game. The first episode of the time-traveling adventure series was released for the Mac and Windows in December, and the second episode was just released in February. Telltale also released an iPad version of the first episode, which is selling episode-by-episode for $7 per episode. Another game to look forward to from Telltale is the second episode of its iOS game, Puzzle Agent. Released last summer as a pilot episode, Puzzle Agent will continue as a series, Telltale has decided. The next episode will be in the App Store sometime this summer.